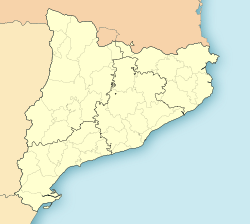 Solsona is a municipality and capital of the comarca of the Solsonès in the province of Lleida, Catalonia, Spain. It is situated in the centre of the comarca in the Catalan Central Depression. It is served by the C-55 road to Manresa, and is linked to Berga and Bassella by the C-26. Until a few years ago, Solsona used to be the main road used by people from Barcelona to go to Andorra. The old town is known as the Nucli antic: it preserves a large part of its fortifications. The cathedral of Santa Maria de Solsona and the episcopal palace are in a neoclassical style. The latter houses the diocesan and comarcal museum and the Museum of Salt (Museu de la Sal), with crystals and objects made from the salt of nearby Cardona. One of the most important events in the city is Carnaval, a pagan celebration that marks the beginning of the Quaresma. Tens of thousands of people come from all over Catalonia and beyond, to participate in the celebration that lasts almost one week. Solsona is home to one of the oldest hunters' association of Catalonia, which held its 75th anniversary in 2015. The city also hosts the only big research centre of Catalonia located outside an urban area, the Forest Sciences Centre of Catalonia (CTFC), with around 100 people employed. ^ a b "Ajuntament de Solsona". Generalitat of Catalonia. Retrieved 2015-11-13. ^ "El municipi en xifres: Solsona". Statistical Institute of Catalonia. Retrieved 2015-11-23. This page was last edited on 29 October 2017, at 20:27 (UTC).